Released in 2009 to commemorate the Hubble’s 19th year in space, this image of Arp 194 shows several galaxies, along with a “cosmic fountain” of stars, gas, and dust that stretches over 100,000 light-years. Some of the stunning views we have of the cosmos owe their beauty to a trick of perspective, as captured in this NASA/ESA Hubble Space Telescope image. The galaxies at the top and bottom of the frame are named PGC 37639 and PGC 101374 respectively. Although it may look as if the two are in the middle of a galactic tug-of-war, connected by the prominent stream of blue through the center of the image, PGC 37639 lies somewhat closer to Earth than its companion, and the two are not physically connected. In another optical trick, this image does not contain two galaxies, but at least four. 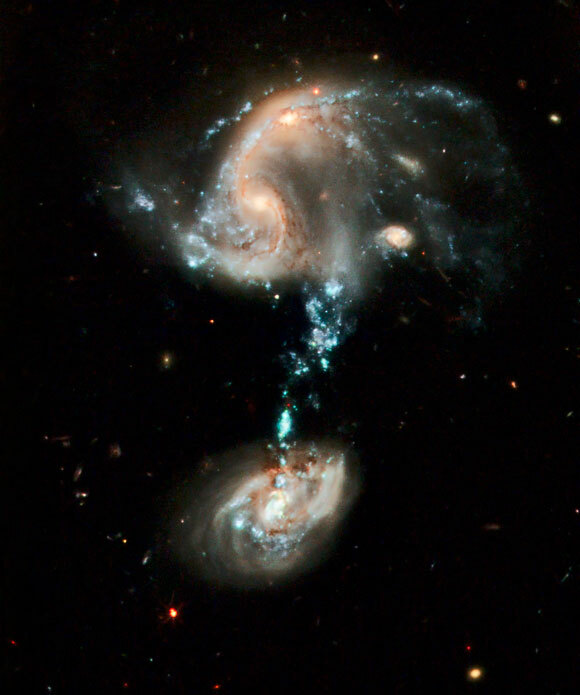 The upper left patch actually hosts two galaxies in the early stages of merging. Their bright centers can still be seen separately, glowing amid a maelstrom of gas and dust. A smaller and relatively intact spiral galaxy, known as SDSSCGB 19.4, can be seen to the right of the merging duo. This trio of galaxies comprises Arp 194, a galaxy group just under 600 million light-years away from Earth in the constellation of Cepheus. The blue stream is thought to have formed through the turbulent gravitational interactions occurring at the top of the frame — the uppermost galaxy clump is a whirl of flailing once-spiral arms. The stream is some 100,000 light-years long, and made up of gas, dust and many millions of newborn stars. These stars, which are clumped together to form star clusters, which in turn later accumulate as superclusters, are responsible for the striking blue hue visible here. They are mostly young, hot and massive, a combination that causes them to emit blue light. Be the first to comment on "Hubble Image of Arp 194 – Cosmic Optical Illusions in Ursa Major"